In just a little over a month, it will be the 28th anniversary of Michaela’s kidnapping. 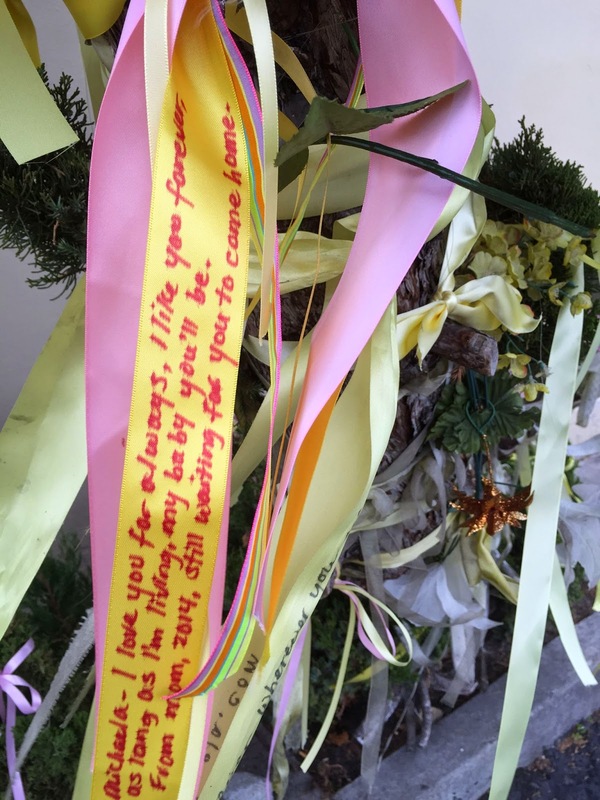 Every year for a long while now I have gone to the market where she was kidnapped and have tied ribbons on the tree that is planted at the parking spot where she was kidnapped, and I have issued an open invitation to the public to come as well. And every year I have wished that I didn’t have to do that, that I didn’t have to do anything, in fact, but if I had to have a missing child to remember, I just wanted to remember her, in my heart. Honestly what I have felt like doing was lying face down in that parking lot, in front of that tree with my eyes closed. Exactly what that would accomplish I don’t know, but it is what I see myself doing, year after year, just collapsing and lying there. My joints are a little cranky for that sort of thing, but in my heart I am prostrate. I am not standing up and trying to think of something to say, in a voice that is powerful enough to reach the few people who show up year after year. Nor do I really want to have to make nice to the members of the Hayward Police Department who show up. I am absolutely certain that there are wonderful people among them, who carry Michaela in their hearts always and would do anything to find her. But quite frankly, I don’t feel that the Department, with a capital D, cares anymore. In June 2015 a team of search dogs from Texas came and located a couple of possible gravesites, led in their search by the detective who was then assigned to the case. After months and months they finally got around to investigating one of those sites, with a small, shallow dig, led by the FBI. I went and checked that site after they were there, and it was about a five-foot circumference, and according to the sticks we stuck in the earth, it was less than 18 inches deep. There were tree roots and compaction, our new detective told me, so they didn’t dig any further. Call me stupid, but it seems to me that in 27 years, an awful lot of root growth can occur, and an awful lot of compaction can take place. The other locations were never investigated at all by the police department. Not only that, but they gave the okay for volunteers to go out there and dig in the ground looking for Michaela. Can you imagine that? I’d been reluctant for this to happen, because I didn’t want to be accused of potentially destroying any evidence, but what the hell, right? It has been 16 months and the police department shows absolutely no inclination to investigate these sites. When our previous investigator took over the case, everything about Michaela had been shoved in a closet, including boxes filled with leads that were never investigated. For a few years he worked his heart out on it. He brought everything out of the closet, tried to organize it, go through the leads which came in before computerization. He was never really given the time to do it, of course. The National Center for Missing and Exploited Children offered to come out and organize and computerize those early leads. They sent a couple of people for a couple of days and then I guess they decided it was too big a job, because they left and never returned. Now those who really cared and were in a position to do something are gone. I don’t know what there is left for me to do. Those people who write and tell me to stop looking for a living Michaela and start looking for her body, I asked if I should trade in my blog for a shovel. Well, we have done that. But the world is a big, big place, and a shovel is very small, and those who are willing and able to help are small and powerless, like me. This is what I think. I think that the only way Michaela is going to be found is if she finds herself. If she is alive and aware enough to reach out to freedom of any kind, I am reaching out to her. Because at this point, if you called and gave the police department the location where she is, I don’t think they would do anything, because the gang members killing other gang members are more important that one little girl who has been missing for so long she will never be found. Despair, that’s what I think is the feeling that makes me want to lie prostrate on the ground. I will go this year and hang yellow ribbons on the tree. I will fill it up, as full as I can. And anybody else who wants to hang ribbons on the tree, please do so. Do it on November 19th, or November 18th or 20th or any old day you want. Please, please don’t forget Michaela. Just forget me. And Michaela, I love you forever. I feel so deeply that I have failed you, that I have permitted others to fail you without ever having to answer for it. If you are alive, I am here, my arms are open, my heart is open. I love you. If you are not, if you are not alive, I hope that you were able to leave this life quickly, with angels at your side filling you with courage and love. I don’t understand this. I don’t understand any of it. I don’t understand why we were chosen for this. I don’t understand how anybody in creation could ever feel that they had the right to do this to us. I love you, I love you. I love you. I'm so sorry you have to go through this, I can't even begin to imagine your pain. I know it's not much help, but I pray for your daughter every night, and hope you get answers about what happened to her. Never give up. Love from Norway. I hope she comes home one day very soon running into your arms I'm so sorry for your lost wish you didn't have to have this happen to your family. But i do remember you as a teenager coming to my house in San lorenzo sitting with my mother when our up stairs neighbor took my brother. That was very kind of you expecially with your lost of your precious daughter. I am so sorry for all that you have gone through, and continue to go through. I am about the same age as Michaela. I remember the day she was kidnapped like it was yesterday. I lived in the east bay at the time. When I talk to my kids about stranger danger I always mention Michaelas name. I pray for you constantly to get answers. I hope you getthose answers. Many prayers and hugs to you and your family. Michaela will never be forgotten. If there's anything any of us could ever do to make this better we would all of us would but because there are no answers there are no Solutions and I'm so sorry for your hurt and exhausted in all of this. I seen this your hope Still Remains alive and that is all we can do please continue to hope she is still out there and thatshe finds her way home. My biggest hugs. Beyond heartbreaking. I wish there were words to ease your years of torment. You and your daughter are in our hearts and prayers. I am so sorry. I wish you could have had some answers or at the very least some closure, but here we are, 28 years later with no resolution. I was a Sr in H.S. in SLZ and I've never forgotten about Michaela. I can't begin to imagine what you have been through, but know that you are in the prayers and thoughts of numerous people that hope someday you will receive answers. I can't begin to know what you have gone through, but I do know you have done everything humanly possible to bring Michaela home. I still remember when she was kidnapped, I was 17 & lived in SLZ. It hit so close to home. I had such hope that she would be found! I am still hopeful that one day someone will come forward with new info. We will never forget Michaela, but you are also in our thoughts & prayers. Michaela is not forgotten.I wish there was something I could do to help you in any way. I literally have looked for that car with the primer fender for almost 28 years. I was a teenager and I remember sitting on the bus every day going down mission blvd searching for the prettiest girl I had ever seen. I feel like I've failed too. This has haunted me my entire life. As a mother I understand how you may feel that you let her down but in your heart of hearts I hope that you truly know you could not control any of this. People have free agency, they are responsible for their actions, not you. They will have to answer for them eventually. I lived over on Oswosso when Michaela was taken. My boys attended Hillview Crest with her. I worked at the Hayward Police Department at the time and we received hundreds of calls each day for weeks and weeks. It was overwhelming, it was heartbreaking. I wanted to reach out to you then but you were surrounded. I pray for you to find comfort in the knowledge that Michaela will never be forgotten. You will be with her again, if not here then on the other side and that will be for eternity. You have done all you can as a mom, please hold on to that and know that, wherever she is, Michaela is so very proud of you and loves you beyond words. If the Hayward Police departmental don't have the resources to find Michaela, why doesn't the FBI? https://www.fbi.gov/wanted/kidnap/michaela-joy-garechtMichaela has a new FBI poster. Sending so much love to you!!! Have you tried speaking to a medium? They might be able to give you the closure you need if she is in fact not alive, and also if the medium cannot channel her, you will have that much more reason to keep looking for your daughter. Be careful because lots of mediums are foney, but there ARE good ones out there. I was skeptical until I had an experience of my own with a medium. It's life changing. Do your research and talk to people who have seen that medium. I'm sure you will find a good one. I was named after Michaela. My mother lived in hayward and new her at the time. She has always been a part of me and i often think about her. Sharon, just know that you have people in your corner, you have people on your side, and even when it doesn't feel like it know you atleast have me and my mom. I know that doesn't bring comfort and I know that doesn't change the way the police and detectives are covering this situation, but its all I have to give other than my thoughts and prayers. We love you, and we love Michaela! I'll never give up hope for answers, It is the story I have been told my whole life and I hold a piece of her dear everywhere I go! Sharon, I am so sorry your family has had to endure the pain, the unknowing for so very long. I want you to know that I pray for your family and Michaela daily. I haven't forgotten. I will never forget. One day your eyes will close on this painful world. And your lovely daughter will be there on the other side, holding out her hand to take you to a land where you two will be together. I believe this to be true not just a mythical story. God cannot let all this suffering go without compensation. Your child will be there. You will see her again. But until that moment try try to give all your love to your other babies. Have you ever had an astrology reading done? There is so much pain in this world,, so many senseless things happening,, so many people living with open wounds in their souls,, so much that I sometimes wish the world would just end. People always say that things happen for a reason,, but I have never been able to believe that,, what purpose is there for suffering?? I do not understand..With that said I dont understand the purpose of missing and exploited children if they walk away from missing childrens cases. I feel missing childrens family are alone in their search,, it is not right,, something should be done to get missing childrens cases back in the spotlight,, does John Walsh help?? Yep. I do them myself and over the years a lot of astrologers have looked at Michaela's chart. Anonymous, thank you for your comment, and I appreciate the depth of feeling you have. I can't print your comment because even if you mean it colloquially, I can't publish threats like that. You did ask a question about how people can pray about these things, so I thought perhaps you might read what I have written on this subject. You can find it at http://www.dearmichaela.com/2016/02/good-god-or-bad-god-or-no-god.htmlThanks and God bless. Dear Sharon I pray that you get a positive closure this year sorry I accidently deleted my comments above. You are an awesome mother your blog is keeping Michaela's case fresh in people's mind you have not failed her in any way. Oh Sharon, how I feel for you. I wish I could wrap my arms around you and magically take away some of the hurt. This year, like every year, I will tie a ribbon to the tree in front of my house. People often ask about the ribbon, and I tell her story. Even though I am on the other side of the world I remember Michaela and hope with all my heart that she is safe somewhere. Please remember that wherever she is, this life or the next, she knows how much you love her. Bridget x.
Dear, SharonSharon I pray that Michaela is alive and that she is some where in California like Jaycee. If Michaela can't reach out to you because she is afraid to like Jaycee she had access to the Internet but was to scared to reach for help. But her kidnapper could be alive and a local person. I don't mean to make it any harder for you but maybe you should write to him on your blog. May be old age will soften his heart. I know that's hard Sharon and again that is just my opinion. some times these type of individuals wants attention. I will light a candle for Michaela on November 19 and I always pray for her. You are a very strong woman. Again you know best it's just my opinion. There really are no words. I just wanted to say, I'm sorry. And my heart is with you and Michaela. Dear, Sharon Wow that is so upsetting, that woman could have remained anonymous and plus she should have been worried for her safety by not reporting it to the police. Because know there is a kidnapper on the loose. I wish I was there because if I saw this sick person driving away with some ones child I would get his plate numbers to the police immediately. Although I was a baby at the time even if I was there no use but wow! What if this crazy person takes your child like that because I feel like Michaela was not his first or last victim the way he took her was brazen broad daylight in a market parking lot. I always wondered how no one other then Trina saw this because it's a market parking lot I'm sure people were coming and going in the parking lot. Sharon I know it was the 1980s but weren't there surveillance cameras anywhere near by? I check your blog every night morning afternoon and evening in hopes of some good news. Sharon words can't describe what you are going through.I pray that lord gives you the best gift before the holidays the safe return of your daughter. Thanks giving, Christmas and new year must be hard on you because it happened that time of the year. But Sharon you are a beautiful strong lady inside out. And who ever took her will be punished either in this life or the next. I can't ease your pain or your suffering and can only pray for answers. If there is someplace that you feel your soul and body rest I can help you get there. Mountains, seashore, forest??? I'd love to sponsor you on a trip to just rest. It isn't much but it's all I can think of. Oh thank you, Gayle. Just your offer refreshes my heart. But I couldn't let you do that. I love the ocean, but in spite of the fact that I live very close to the Pacific, I can't even tell you the last time I made it out there for even a day trip. I have a bit of agoraphobia I think. Sharon, I'm so sorry. I feel frustrated on your behalf. Older kidnapping cases are so very important to solve, both for answers for the family, as well as the safety of society.What frustrates me is that perpetrators of cold cases (unless deceased or imprisoned on other charges) are free to roam the streets.I pray for resolution for you soon. Ok. There has to be way for this case to be re evaluated! I am sick of hearing exuses. It is the police dept and fbi's responsibility to find this child. I am sure after all these years there is enough evidence to start over. For God's sake Michaela was taken in a grocery store parking lot. I find it hard to believe that no one had ever seen this guy. People don't usually just park in a grocery store lot and stalk children. Nothing here makes any sense. We have a witness (although a child) but appears to be an intelligent child. A description of the kidnapper and car. I find it VERY hard to believe that this so called man never went into the market. Not to mention the older woman who saw the car speeding away. There has to be other people who saw something that day. I truly believe that this person went into the market that day. Why else would he be just sitting in the parking lot unless he followed the girls which is unlikely. There has to be evidence that could bring Michaela home. Too may leads and suspects that have not been followed up on. I feel that law enforcement and others have given up and that cannot be allowed to happen. There is at least one clue that would lead to another and another somewhere to end this nightmare. Dear, SharonSharon, this heartless animal that abducted Michaela should have been captured a long time ago it's disgusting that he is out there free. And you are suffering for the past 28 years. Is there anyone in higher power you can contact and ask for intervention in solving this mystery? Like the pervious individual stated that it's hard to believe that this animal never went inside the market. He probably was really familiar and comfortable in the area. It's very hard to believe people didn't see this pocked marked faced person. Michaela has to be some where if we can't find her we can find her abductor he could be still in the area if he is alive. I pray he is alive and pays for his heartless crime. Sharon you did all that was in your power to find your lovely daughter. If anyone has seen anything at all no matter how small you may think it is just please please report it could be that piece of information that could solve this mystery. Lately I have been thinking of Michaela a lot. Michaela if you are out there some where do not believe any one if they tell you that you have no way out of your situation your mom loves you so much and wants you back. There is nothing like your first born baby. Listen to your mom leave her an anonymous message. No one has to see it call her contact her end her suffering if you are here please. Michaela everyone will support you there is nothing that you can't over come and it's not your fault that you were kidnapped just please contact your mom. The mom that loves you so much and is always reaching out to you. Sharon, we are listening to you and reading your words. We stand with you. I wish so much you could get answers. Thinking of you and Michaela always. Thank you! I am still reading the book, slowly because I find myself more reluctant to engage with the subject than I thought. But I am enjoying it, particularly all the subtle observations, like thinking that the tree had been sitting there growing all the time Ethan had been gone. That's the kind of thing I think about. I remember when my dad was dying I looked out the hospital room window and could see where they were building a new housing development, and I remember thinking it was odd that they were building houses when the world was ending for my dad. I'm going to have to write a whole blog about this, because I get these kinds of questions so often. But the short answer is yes, of course they did. They are not, in my opinion, doing their job now, but in the beginning they most certainly did to the best of their ability. I agree! This has been going on LONG LONG ENOUGH! They need to keep looking for her! The answers are lying inside all those cabinets and desk drawers! Time to get the leads back out! And, no matter how long it takes they all need to be looked into AGAIN! She is somewhere and she NEEDS to be FOUND already! Makes me sick. I can barely find the words… Can't see the keyboard through my tears… Nothing you have done has failed your baby girl. You are the symbol of strength and love, Sharon! To have the courage to go to that tree, year after year, remaining hopeful! That takes amazing strength and love. Now it's OK to rest, to cherish her memory, and wait until that glorious time when you meet again!